Lion Guard Short Stories are funny little stories of fanart involving the Lion Guard and some (un)intended bad English. Enjoy! Kion and Bunga hang out in the den of the Guard, outside the den the temperature is too hot to be that active. Since there is no digital communication in the animal kingdom, Bunga and Kion have no clue of the whereabouts of their friends Ono, Beshte and Fuli. Bunga brags about all the challenges he has won. " Uncle Timon once dared me to eat ten bugs at the same time, guess what I.." Kion interrups him with an impolite yawn. "you already told me that. Now let me tell you something instead." Bunga screams in yoy. "You made me extremely curious of your previous habits, please go on and tell me your interesting story" Bunga adds to the conversation. " are you beeing sarcastic?" Kion furiously roars towards Bunga. "no just interested. tell me." Bunga yells in frustration, eager to hear what his best friend has to screech.
" I challenged my sister Kiara once. In a river race" Kion laughs hysterically. Bunga nodds. " I see. What happened and how did it occur?" Kion starts:" Kiara and I were bored on a hot day just like this one. We decided to dare each other into jumping and swimming in the river. We didn't go in the deep part so all was safe. Kiara told me she was a faster swimmer. We did a swimming race and she was slower than me on the other side of the river. By swimming faster I proved my sister wrong and declared myself a superior swimmer"
Bunga was impressed. " wow such a story! now let's take a nap!" They agreed to take a nap. One day the five members of the lion guard went to the gorge, out of pure boredom after their morning patrol. Kion tells his friends an enthusiastic story about the history of the gorge and his grandfather dying in the gorge. "interesting" Beshte nodds. "I never knew king Mufasa died in THIS gorge"
Fuli snorts:" this is the only gorge in the Pridelands, Beshte." "is it?" Ono asks curiously. "yes it is" Kion confirms. Kion continuates about earlier happenings that involved this specific gorge. " Hyenas used to hunt in the gorge before they got banned from the Pridelands" Kion told his friends. " My dad told me"
His friends reply in disbelief. "ok"
Then they run off and dive into the river for some swims and splashes. wow september 4th brings us a date and an episode. that is surely a great thing to hear today! Kiara and Kion were sibling fighting in the family den when Simba walks in and ends the mischief with a single, loud roar, followed by a slap of the paw. "now play nice, sweet children!" the king smiles and continues on his royal duties routine. Kiara is bedazzled and decides to meet with Tiifu and Zuri, girl fun and the regular rating of colourful flowers near Pride Rock. Kion aborts towards Fuli, who happens to live on her own like a full adult. She is all climbed up towards a tree when Kion arrives. "whatcha doing?" Kion screams into the treetop. "nothing" Fuli answers. "wanna play?" Kion returns. "no, i feel sad" Fuli replies. "ok" Kion answers and runs towards Bunga. Bunga welcomes his friend and invites him to eat spiders and other vermin. Kion stays all day and have fun with also Timon and Pumba. Then the evening falls up and Kion heads back home to his mum and dad and sister Kiara. They all are in happiness and fell asleep while the moon rises once again. Excellent stories, keep up the good work! after receiving some very motivating positive reviews and critics I've decided to intensify the Short Stories! The royal family was woken early that day, because Simba was up before sunrise with a bad caugh. "I might be contaminated with the flu" the wise king spoke. " I need to rest, Kion, I want you and the Guard to take over my appointment with the baboon leaders, I'm taking the day off." Simba falls on the floor of the den with a loud bang. Kion jumps around in excitement. " I love to take over your royal duties!" he moans. "It is the only thing I had scheduled for today, so take your time my son" spoke the king. Simba stood up and curled up in a more comfortable sleeping position. Kion ran off to inform his fellow Guard members, leaving the sleepy lions behind. After a while Kion construated all his friends together. Conjoined, they walk towards the baobab tree where the baboons hold their meetings. Fuli is not to eager to meet them, but left without a choice as a Lion Guard member, she realises that with great responsibilities, comes an incredible loss of relaxation. "Baboons, I, prince Kion, come in my fathers place, king Simba, since he lays down with the flu!" Kion roars. Two baboons fall out of the baobab tree as a result of his roaring. "Wish your father well, we are Ngoro en Ngiri" a reddish brown and a pale grey baboon shake Kions paw. The rest of the Guard watches this happening. "We are not feeling too well either, tell your dad we meet next week!" Kion screams in happiness. "i will, thank you!" and runs off. The others follow him. "What was that? Why are you so extremely cheerful about a cancelled appointment?" Beshte asks. " It means we have the day off, let's play tag!" 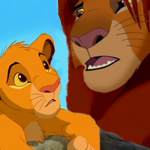 The Lion Guard continuates their day in joy and later Kion informs his father. Wow just wow. Ive never read such a great story. You should seriously consider a career in writing. One day, Fuli and Kion were running around and screeching at the lower parts of Pride Rock. Bunga added himself to the mischief and started running around too. Kion and Fuli stopped. "Bunga, what on earth are you doing?" Fuli asks in concernation. "Just the same as you, adding to the fun!" Bunga replies. "that is not how it works, Bunga!" Irritated, Kion and Fuli leave the scenery witholding a devastated Bunga, who goes to Timon and Pumbaa for advice. "Timon and Pumbaa, Kion and Fuli are acting up in a peculiar way.." Bunga hisses. Timon comforts him and catches him some vermin. "eat, you will feel better and more confident. Why did Fuli and Kion act peculiar?" Pumbaa asks. "don't know.." Bunga rolls his eyeballs. " They are my friends but they exclude me from their activity, which is highly unusual for them to do" Bunga explanates. "Just ask your friends why they react in that specific way then!" Timon starts to lose his temper too. But Bunga knows enough. He just needs to ask! With a loud scream he runs off, leaving his foster parents in confusion. Later, Bunga arrives at Kion and finds Fuli also there. "hey you two, what was it all about this morning? With the reactation??" Bunga straightens his back bone to impress them. "i don't know" Kion answers. "me neither" Fuli replies and rolls on her back, in and extending her claws. "let's play then" Bunga yells. "no, we don't want to" Kion replies. "but tomorrow, we do want to play and go on a big adventure. join us?" Kion smiles. "are you childing? sure!" Bunga jumps around in extreme excitement, what a powerfull disclosure! Queen Nala sees the three youngsters from a distance and smiles. Today is a good day to be vibrant and alive. That was such a great story! When are you going to make more? That day, Ono was flying over the Pridelands to see if any illegal hyenas were trying to pass the borders of the kingdom, but he saw nothing abnormal and decided to surprise Bunga with a visit.
" good morning Bunga! are you there?" Ono screamed when he entered the Paradise Falls where Bunga lived with his posperous parents. Timon and Pumbaa greeted him. "Bunga told us he is playing hide and seek, we haven't seen him ever since.." Timon explained. "With whom?" Ono replies. "Whom?" Pumbaa confuses the conversation by beeing gullible. "Is Bunga playing hide and seek with a friend?" Ono reproduces his question in simplified language. "Nope, Bunga likes to play it by himself" Pumbaa anwers. After hearing this, Ono decides he needs some time apart from Bunga and flies to Pride Rock, where Tiifu, Kiara and Zuri hold a pageant contest. "May the most gorgeous win!" Zuri screams. Kiara joins the fun and decides to scream too, and a few moments later Pride Rock is filled with happy, running and screaming lion cubs. Ono lands on a branche and observes. "Kiara!" a male voice bulbs aboit. Kiara lays flat and the other cubs run away, all together. " Simba is coming" Zuri whimpers. Tiifu nodds. "and he sounds angry.." Simba opens up while he arrives. "Kiara, I am actually upset with what I heard about you!" the king bumps into the rock near the cave. "life is not about being a beauty pageant, it is about leadership and royalty." Simba grins. " you have failed me and dissapointed me" Kiara shivers when her father sends her away. But as she walks away, Simba roars loud. "it was a joke, you can stay and do ya thang" he adds in slang. " That is quite a relief to me!" Now both Simba and Kiara cry in joy and Ono, who have seen all this, decides to tell the Guard about it. They have a good laugh and with that, another joyfull day at the Pridelands end. Nala was out hunting, she brought Kiara and her two best friends along for a lesson. "Take two! Zuri run!" Nala sneers loudly. "Mom, you just told us to lay down and be quiet!?" Kiara asks confused. "Switch! Prey switches too. Think and do fast, it is your food and your safety we are talking about" Nala yells. Kiara gets on her feet, when suddenly Tiifu, who has been silent during the whole hunting lesson, starts to scream and runs off. Nala, Kiara and Zuri follow her with their eyes. They see nothing that could have scared Tiifu or caused her to panick, so they shrug and move on with their lesson. A few metres away, the Lion Guard is taking their afternoon nap. Bunga is the first to wake, he jumps up amd lands on Beshtes back. "awaken, bigbee!" he cries as loud as he can. Fuli tilts her head annoyed. "Sleep Bunga, lie still" Kion giggles. "You could use a hunting lesson, Fuli!" he smirks. "or two!" Ono screeches in laughter. Suddenly, Fuli jumps up and runs away very fast, while screaming loudly. The rest of the Guard look around. Nothing that could've triggered Fuli.. Suddenly they hear a loud roar. Simba Nala, Kiara and Zuri walk in. "Tiifu is missing. She ran away screaming for no reason. Have you seen her?" Nala yells. "No, but Fuli did the same thing a minute ago.." Kion replies in vast anger. "they have no reason for this, thus they must be punished" Simba answers. "Not neccesary" Nala replies. "Ok, then I'm done" Simba walks away after turning around to avoid bumping into each other. After a short while, Tiifu and Fuli return, together and giggling. "What?" Ono is confused. "We joked you!" Tiifu laughters. " all your faces were confused!" Fuli cannot stop laughing, the others now see the fun of it. Another happy day ends with all of them joking and after that, Nala drags a dead zebra into the scene for them to feast at.